The situation these countries are in is that their economies are suffering because of the population logistic curve! So, in regards to the students in such a course as I taught, are these students to think that a stable population is a good thing or a bad? There is even a political point of view, one that I disagree with, that people in such aging, developed societies should be discouraged from practicing birth control. My belief is that, rather, there ought to be a way to have a developed society that does well whilst not pushing people into buying so much stuff…. There is good reason to believe that human population will peak sooner and lower than the UN Median variant. Namely, fertility rates ( annual data from the CIA ) are lower and falling faster than the UN median variant. Current rates of change imply fertility at less than replacement ( somewhere between 2.1 and 2.3 globally ) within a decade and falling population within a generation. Population in 2100 will likely be lower than present. Given that CO2 emissions appear to already have peaked, and that some 72% of CO2 emissions are from countries with already less than 2.1 TFR, falling CO2 rates of emission growth would also appear likely. This is somewhat ironic, given that some of the global warming emphasis was on restraining growth, but economic development leads to population decline. So, increasing economic development benefits humans and the environment. Things are not necessarily rosy though, because population growth is itself a term of economic growth. Some of the populism and political upheaval may result for reduced growth and a growing disaffection with being a less viable human in a slowing but robotic led world. Eddy: I believe the SRESs broke the World up into regions and looked at population, economic, and technological growth in each region separately. In theory, they have taken into account the fact that the largest emitters would have stable or decreasing population. So far, total CO2 emission has followed the most pessimistic estimate. The situation may look slightly different today that when the SRES were created. If we have fewer people than they expected in 2100 (pick 10% fewer for simplicity); how much will that reduce the forcing in RCP 8.5? Since forcing accumulates over time, their forcing might be 5% too high from a population that is 10% too high. Changing RCP 8.5 to RCP 8.0 isn’t going to help much. So far, total CO2 emission has followed the most pessimistic estimate. 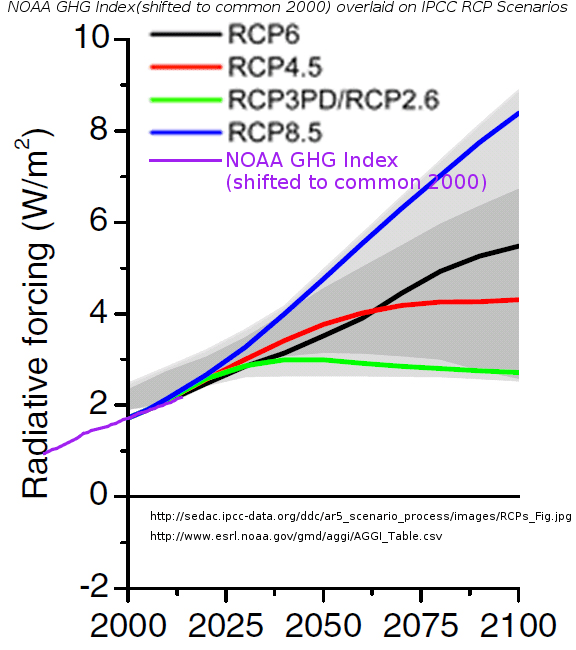 That’s forcing, not emissions, of course, but indicates we are at the low end of projections. The increase in Chinese GDP/capita and their rise to #1 emitter (2X the US and growing in total emission; equal to the EU in emissions per capita) tells me that economic growth and the carbon intensity are far more important factors than population. This slows down growth and demand ( old farts just don’t spend as much and certainly don’t produce as much ). The trend toward falling fertility is based on the pill, economic development ( from agrarian where children were a working asset as early as age 5 to an information economy where children are an expense and may not work until age 25 or later ). These trends are global and are occurring even in the face of government policy ( paying parents to have children, or religious governments forbidding contraception ). Assuming they continue, populations will be lower than it is now in 2100 and much older. CO2 emissions will be at the low end of projections. Emissions may or may not have peaked. What hasn’t happened is for the rate of increase of atmospheric CO2 to slow. The recent El Nino caused a spike in the year over year rate, but it looks like it’s returning to the trend line. I’ll put up a plot as soon as photobucket comes back on line. DeWiit, these are monthly through 2016? It will be interesting to see what happens past the recent El Nino. Yes. It’s the year over year difference to minimize seasonality. That is it’s December 2016 – December 2015, etc. I expect a dip below the trend line. in the next year or so. That looks to be what’s happened after the 1998 El Nino. One conclusion from Gerland’s PDF is the RCP2.8 population assumption for 2100 is <10% probability and RCP8.5 is slightly <90% probability, putting both well within the unlikely category on this dimension. The economist and demographer David Lam, in his magisterial 2011 presidential address to the Population Association of America, identified the keys to global prosperity in the face of record rates of population growth..
How the World Survived the Population Bomb: Lessons From 50 Years of Extraordinary Demographic History, David Lam, Demography (2011). There is much to worry about in the coming decades. Between 2011 and 2050, the world will add 2 billion people, the equivalent of two more Indias. Evidence of flattening crop yields, increasing food prices, and climate change provides plenty of cause for concern. But the lesson of the last 50 years is that the world survived challenges that were in many ways much more daunting. Instead of adding 2 billion people in 39 years, we added 3 billion people in 39 years. Rather than the 30% increase that’s projected between 2011 and 2050, we increased by 100% between 1960 and 1999. The world is projected to reach 10 billion people by 2083. The challenge of adding 3 billion people in 72 years seems somewhat less challenging when we keep in mind that we added 3 billion people in 39 years between 1960 and 1999, an increase of 100% rather than the 43% from the next 3 billion. We have seen that during the last 50 years of historically unprecedented population growth, we experienced substantial increases in food production per capita, declines in resource prices during the period of most rapid growth, and decreases in poverty rates in developing countries. School-age populations grew faster than they will ever grow again, yet we saw the largest increases in schooling we’ll ever see. Given all this, I remain in the camp of the optimists. I’m sure that by the time of the 2050 PAA annual meeting, the world will still face important challenges, but I also expect that it will have improved in many ways, including lower poverty rates, higher levels of education, and plenty of food to go around. I’m optimistic not because the problems posed by continued population growth are simple or because they will take care of themselves, but rather because the last 50 years have demonstrated our capacity to recognize the challenges and to tackle them with hard work and creativity.